A 'Han' dog made of slices of architectural brick. One of the more interesting ways of circumventing TL dating has been the use of genuine pottery of the period to build a new object. Clearly, the TL age will be correct, and very misleading. For this reason it is extremely important that object be examined by an experienced conservator before any consideration is given to having TL measurements done. One of the best ways to examine an object is by radiography. 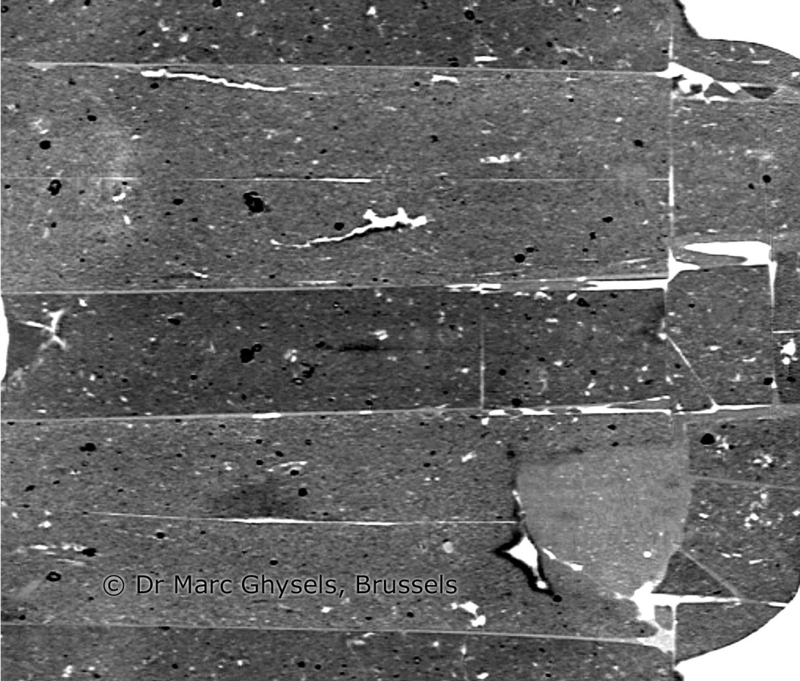 Conventional x-ray films can be useful, but often difficult to interpret, in part because there is a superposition of both sides of the object on the film. Computerized tomography (CT) scanning, though rather expensive (unless you have a radiologist in the family or as an acquaintance) yields wonderful images, and contrast may be enhanced to give excellent discrimination between pottery and infill, and so on. Recently a paper was published in Europe that gives several very nice examples. The reference is: Ghysels, Marc, “CT Scans in Art Work Appraisal”, Art Tribal, Winter 2003, 1(4):116-131. Marc Ghysels is a radiologist in Brussels, Belgium, and may be contacted at the address at the end of the page . He has very kindly permitted Daybreak to put some of his figures on our web site. A. Dog, China. Terracotta, 58 cm. Thermoluminescence (TL) analysis gave an age of 2.000 years (± 20%) and an analysis of the chemical composition of the terracotta revealed no anomaly. B. CT: thin axial sections through the head, the forequarters and hindquarters (markers shown in Figure A). They reveal that the main tubular structures are composed of terracotta slabs. 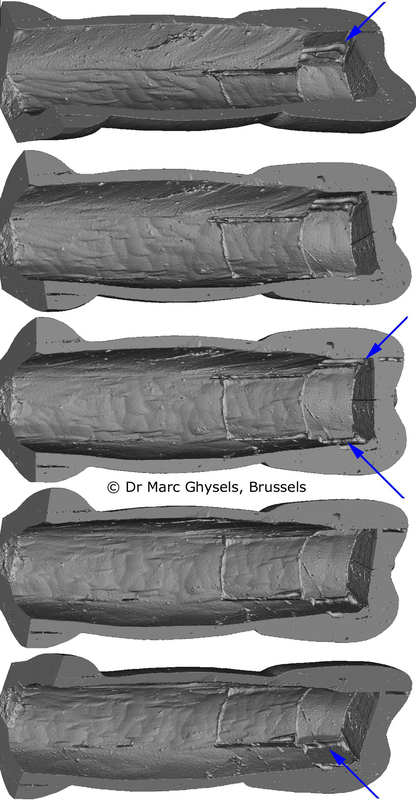 The CT scan emphasizes the different density of the slabs, proving that the dog has been assembled. The bulging cement joints inside the statue, which are of lower density and therefore lighter, show up clearly (arrows). The technique of assembling terracotta slabs cut out of excavation bricks and then carving them into a sculpture gives TL results compatible with an ancient piece. 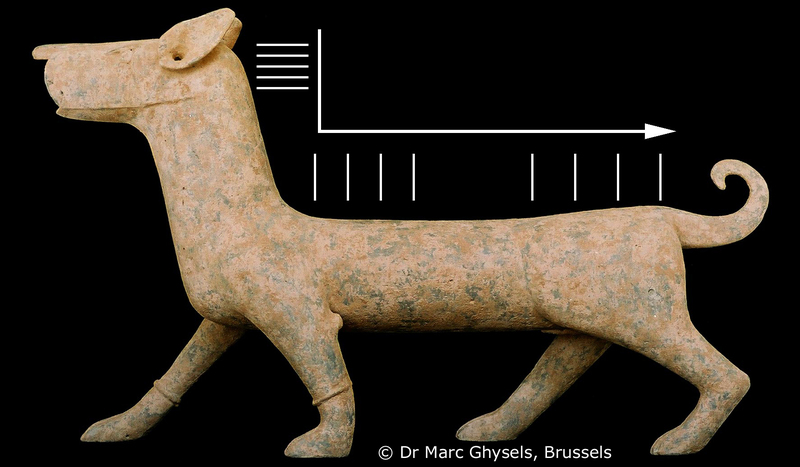 C. CT: a flattened view of the dog’s body, following the movement of the curved arrow, which confirms the juxtaposition of different terracotta slabs. 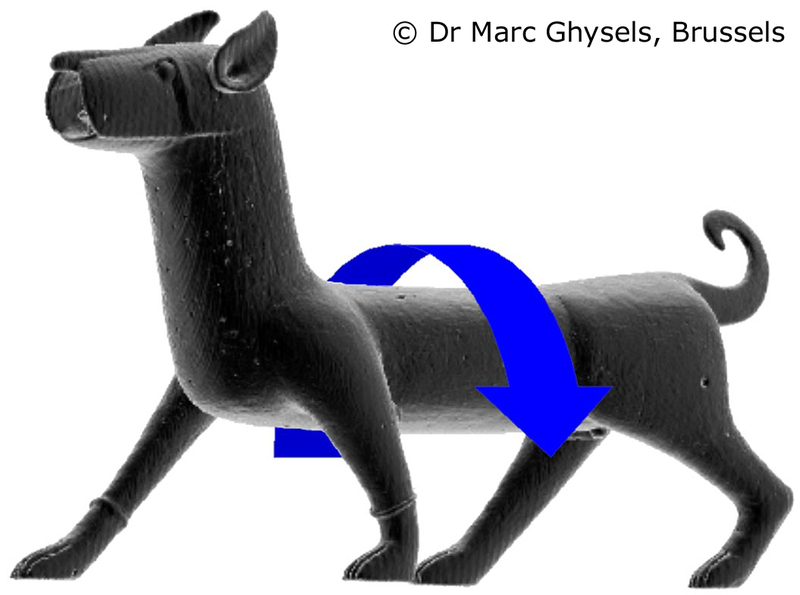 D. CT: inclined 3D views of the inner wall of the dog’s body. It shows that the terracotta has been scraped out to ensure that the weight of the finished sculpture is comparable with that of an antique piece. There are also dribbles of cement (arrows) on the inner curves of a trapdoor cut in the animal’s back. Indeed, although the inside of the head and the neck could be reached through the open mouth, a temporary trapdoor had to be cut out so that a scraper could be inserted into the dog’s belly.